On behalf of admin of JML Law, A Professional Law Corporation posted in wrongful death on Saturday, Nov 04 2017. Halloween 2017 may be over, but its devastating consequences aren’t. And we aren’t even talking about all the bloated kids who can’t eat any more candies, we’re talking about injuries and deaths (yes, this escalated quickly). Several deaths were reported this past Halloween as well as many more injuries caused by slip and fall accidents, food poisoning, drunk fights, DUI… and the list goes on and on, as you may have guessed by now. But one incident in particular stood out. At a Halloween party at a Westminster nightclub, a man was killed and another was injured, while the shooter escaped on foot. And while the police is still looking for the shooter, the consequences of the shooting could have been so much more serious, as there were reportedly about 100 people inside at the time of the shooting. While police is interviewing witnesses, they still have no description of the shooter. If something like this happens to you or your child in Los Angeles, Long Beach or elsewhere, who should be held accountable for the injuries or even deaths? Apparently, the owner of the nightclub. A case like this may amount to a premises liability claim, as the owner failed to provide visitors with proper safety measures and the shooter somehow managed to sneak a gun into the club. Who’s responsible for your injuries at a Halloween party? The incident occurred at Bleu Restaurant & Dancing early in the morning, and it’s safe to assume that many were overly intoxicated that night. It’s also safe to assume that there were underage people drinking. Masked or unmasked, with or without a Halloween costume, it’s prohibited by federal and state laws in California to serve alcoholic drinks to underage people. If the shooter was intoxicated at the time of the incident – and particularly if his intoxication caused aggression and prompted him to fire a weapon – the owner of the nightclub may be held liable as well. You see, Halloween parties can be fun – but only when you know that you’re safe there. You probably know this from your childhood: if you host a Halloween party at your house, you’re responsible for every minor guest in the house (adults are responsible for their own actions, but you may still be liable for their injuries and fatal accidents if you were negligent). Being a “social host” may be a big burden, as you not only have to provide guests with food, drinks, candy and make sure that everybody is having a good time, but also because you must ensure everyone’s safety. 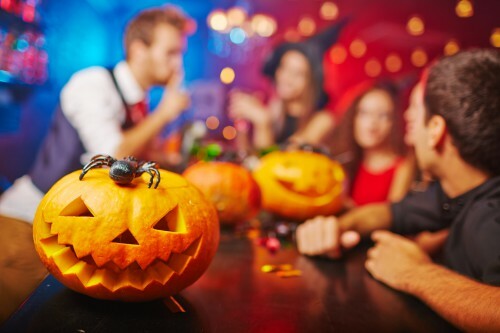 Nightclubs, bars, restaurants or other establishments that hold Halloween parties (or any other parties, for that matter) may be held responsible for injuries and deaths that occur within their premises. Attending a Halloween party may have grave consequences if you end up being taken out of there on a stretcher and transferred to a hospital. And unless you suffered an injury from your own fault, you may hold those responsible for your injury liable and get compensation. Here at JML Law, we offer our clients a thorough and unbiased investigation into their personal injury or wrongful death case. Whether an injury or death occurred at a Halloween party or elsewhere, our skilled Long Beach attorneys will conduct an investigation, gather witness accounts and, if necessary, exhaust all legal options to get you the compensation you deserve. Call JML Law’s Long Beach offices at 818-610-8800 or send an email today to get a free initial consultation.